Trevor Hardy is a Research Engineer for Pacific Northwest National Lab. He received his bachelor's degree from Letourneau University in Longview, Texas in 2014 after which he spent several years in industry. His first position was at Micron Technologies in Boise Idaho where is developed test routines for process development product followed by several years at Cessna Aircraft Company where he developed embedded systems for aircraft control. He completed his Master's Degree in Electrical Engineering from Wichita State University in 2010 where is thesis was on the laboratory-scale emulation of wind turbines. In 2014 he completed his PhD at Wichita State where his dissertation explored the economics of energy storage. Co-simulation - Lead the development of several uses-cases as a part of the development of DOE's multi-lab co-simulation platform, HELICS. 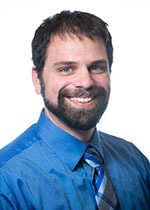 Trevor also assisted in leading the development of an interconnect scale co-simulation experiment that modeled 100,000 electrical distribution systems with 11 million homes as a part of the PNNL's Control of Complex Systems Initiative. Communication systems - Assisted in the development of communication system models for neighborhood power systems that were used for DARPA's RADICs program. Microgrids - Lead the economic analysis of several proposed microgrids for remote Alaska communities as a part of the multi-lab Alaska Microgrid Program. Also developed a microgrid resilience analysis tool for military bases to assist in the design of installation-wide microgrids. Energy Storage - Worked with several local utilities to develop models and control architectures to maximize the value of their energy storage systems. Hardy T.D., and C.D. Corbin. 2018. Qualitative Description of Electric Power System Future States. PNNL-27315. Richland, WA: Pacific Northwest National Laboratory.